A proposed model for recurrent C. difficile infection and the restoration of the intestinal microbiota through bacteriotherapy. Ever wondered what other functions your large intestine performs apart from digestion? Ever thought of the contribution our little friends in this organ play in relation to health and disease? What about the food you eat on a daily basis? Do you know it could determine the composition and function of our little friends? By the way, what little friends am I talking about? Our little friends are microorganisms (bacteria, archaea, viruses and eukaryotes) that inhabit the length and breadth of the gastrointestinal tract. Estimates based on metagenomic analysis suggest that trillions of these little friends, referred to as the intestinal or gut microbiota, live inside each of us. Of this large microbial consortium, bacteria are mostly dominant and have been largely studied, with researchers estimating that there are around 500 to 1,000 different species present. So, why do we harbour these little friends? To answer this question, I must return to the very first question I asked. The large intestine, which harbours our little friends, is involved in several functions apart from digestion. These range from developing our immune system and acting as a barrier against pathogen invasion (known as colonisation resistance), to metabolising foreign substances, such as drugs and generating beneficial compounds, such as vitamins. Before talking about how to keep our little friends happy we must ask, what can make them sad? Disturbances in the intestinal microbiota caused by infections and antibiotics have a significant effect on the microbiota’s composition and function. Antibiotics drastically reduce the diversity and abundance of our little friends, which can predispose us to pathogen colonisation and overgrowth and lead to antibiotic-associated diarrhea (AAD). For example, Clostridium difficile, an anaerobic spore-forming bacterium is the leading cause of AAD in hospitalised patients. It is characterised by foul smelling diarrhea and can lead to fulminant colitis, an inflammatory bowel disease, and even death if not properly treated. About 14, 000 deaths each year in the US are attributable to this infection, according to the Center for Disease and Control Prevention and, in England and Wales, over 1,600 deaths were attributable to C. difficile in 2012. The antibiotics metronidazole or vancomycin are commonly used to treat this infection. However, 15 to 35 per cent of patients treated with these antibiotics experience recurrence of this infection after cessation of the antibiotic therapy. So what is the way forward? Faecal transplantation has been used as an alternative treatment for patients with recurrent C. difficile infection. It involves restoring the intestinal microbiota of a patient by putting faeces from a healthy donor into their intestine. However, finding a suitable donor and general patient aversion to the procedure could sometimes be limiting factors in this process. Therefore, the design of a combination of harmless health-associated bacteria (bacteriotherapy) is urgently needed to combat this limitation and infection. Beyond this, always maintaining a healthy lifestyle and diet will keep our little friends happy. Blessing is a PhD student in the Bacterial Pathogenesis team at the Wellcome Trust Sanger Institute. Adamu BO, Lawley TD. (2013). 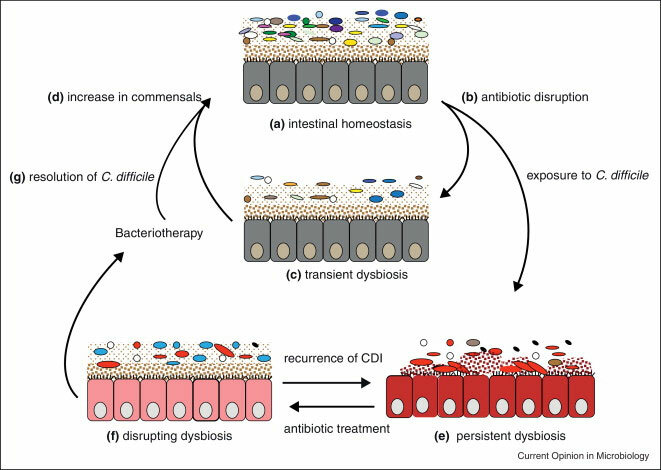 Bacteriotherapy for the treatment of intestinal dysbiosis caused by Clostridium difficile infection. Current Opinion in Microbiology. doi:10.1016/j.mib.2013.06.009. I read through it over and over again. Dear Blessing, please keep it up!